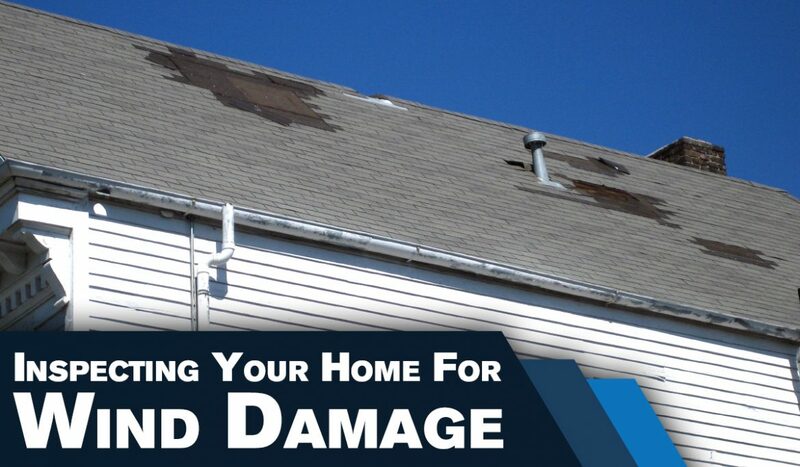 Even when a storm produces no snow or hail, your roof can still sustain damage. Spring winds can be a force to reckon with. Strong winds create stress points that can weaken and compromise your roof. While roofs are designed to resist typical winds, after years of high wind exposure they can be incredibly damaged. Identifying problems early will allow you to fix them properly. This makes sure that one or two missing shingles today doesn’t turn into a leaking, damaged mess down the line. How Can High Winds Damage My Roof? Strong wind damages your roof in one of two ways: The Sheer force of the wind itself or through the debris that it picks up and throws against your roof. Wind will not uniformly damage your roof. Areas like corners and perimeters can be highly susceptible to higher wind pressures, while the center of your roof may be fine. According to the National Roofing Contractors Association, most wind damage will start at the edge of the roof. However, if strong winds come across any weak spots, like fasteners, they will get under the shingles and shred them or lift them right off. After one piece is gone, the wind will have more to grab next time, creating a chain effect. After repeat exposure, this small problem can grow over time. Once a whole corner of insulation is exposed, rain can get in and start leaks and water damage. This can only be avoided by making sure the materials on the edge and corners of your roof are strong enough and in good condition to withstand high winds. The wind itself isn’t the only thing that can damage your roof. Significant winds also move debris which can make its way onto your roof. Shards of glass, tree branches and other debris can sometimes be more damaging than the wind itself. When investigating your rood after high winds, check for debris that may have blown onto or across your roof. Take a look at your gutters for debris that may have become clogged and create other problems. To decrease the amount of debris on your roof, keep trees trimmed and away from your roof. Tree branches touching a roof will scratch and gouge roofing materials when blown by the wind. Falling branches from overhanging trees can damage, or even puncture, shingles and other roofing materials. Examine your shingles. Are they loose, missing, cracked, dented, scratched, or marked in any way? If the damage covers less than 30% of the entire roof, roofing repairs may be a good solution. If the damage is extensive, you may need to consider a roof replacement. Keep in mind the other parts of your roof that can be damaged besides your shingles, like the chimney, ventilation, pipes, and gutters. Here is a basic list of what to look for. Gutters: Decay or rust, leaky seams, loose gutters, bent or sagging, missing sections of gutter or downspout, filled with debris. Chimneys: Leaning, loose or missing flashing, damaged bricks, cap or cracked joints. Each component of your roof plays a critical role in how your roof performs. You want to make sure everything is in good condition, especially after your home has been hit by a strong storm. However, keep safety in mind. Always wait until the wind has died down to take a walk around your home to reduce the risk that you may be hit with flying debris. In the days and weeks after a wind storm, keep a watchful eye out for damage to the inside of your home. Moisture marks, brown/yellow/grey stains, and peeling paint are all signs that you have a damaged, leaking roof. Also, take note if you have a sudden surge in energy costs as that could be an indication that your roof ventilation has been compromised. What Should I Do if My Roof Has Been Damaged by Winds and Needs to Be Fixed? If you discover or suspect your roof has been damaged by high winds, contact an experienced roofer to assess the damage and perform required repairs. Even if you notice a small problem, address it now before it turns into a long-term disaster. Roof replacement and roof repair cost less when you don’t have to add in the other costs of repairing leaks and water damage. At Titan’s Roofing, we hope your roof and home made it through the Spring wind storms. If you weren’t so lucky, contact us. We will be happy to inspect and fix any damages caused by windy, stormy weather so your roof can stand up to anything else Mother Nature has in store this Spring.